Instead, we added a conventional cake ingredient that's unconventional in gingerbread: cocoa powder. Cocoa contains a high proportion of absorbent starch; just 1/4 cup of it soaked up the cake's excess moisture, so the crumb was no longer objectionably sticky. The cocoa also deepened the color and flavor of our gingerbread without making the cake taste chocolaty. As a bonus, it diluted some of the gluten, making the cake's crumb more tender. Cook's note: Prepare frosting to the cooling stage before mixing cake. Adjust oven rack to middle position, and heat oven to 350 degrees. Grease and flour two 8-inch round cake pans, and line pans with parchment paper. Whisk flour, cocoa, ground ginger, baking powder, cinnamon, salt, pepper and cayenne together in large bowl. Whisk coffee, molasses and baking soda in second large bowl until combined. Add sugar, oil, eggs and fresh ginger to coffee mixture, and whisk until smooth. Nutrition information per serving: 590 calories; 201 calories from fat; 23 grams fat (3 grams saturated; 5 grams trans fats); 38 milligrams cholesterol; 365 milligrams sodium; 94 grams carbohydrate; 1 gram fiber; 75 grams sugar; 3 grams protein. In a medium saucepan, whisk together the dry ingredients. Whisk in milk slowly until smooth, and cook over medium heat, whisking constantly, until the mixture boils and become thick, 5-7 minutes. Remove from heat. Cool completely (at least 2 hours). To finish: With mixer, beat butter on medium-high speed until light and fluffy, about 5 minutes. Add the cooled milk mixture and vanilla, and mix on medium speed until combined, increasing speed to medium-high and beating until the frosting is light and fluffy, 3 to 5 minutes. For more recipes, cooking tips and ingredient and product reviews, visit www.americastestkitchen.com. 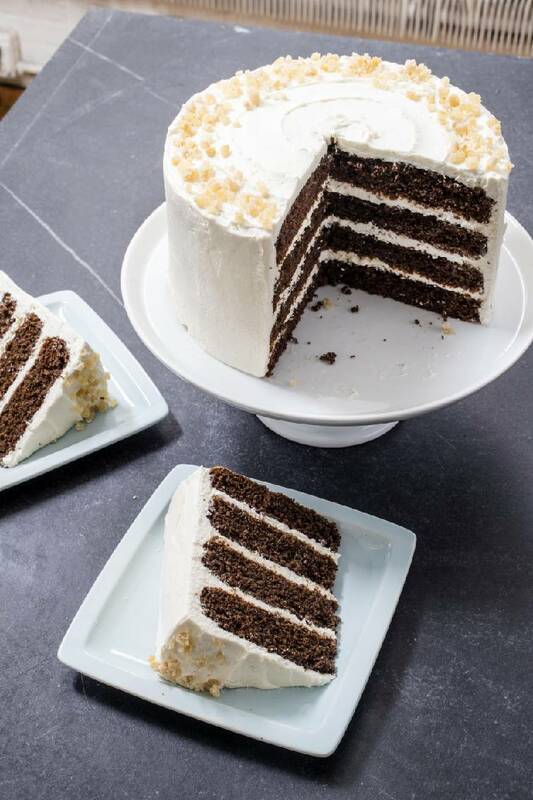 Find more recipes like Gingerbread Layer Cake in "The Perfect Cake."